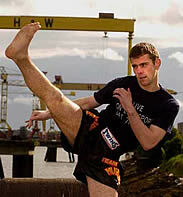 GARY ” THE KID OF BELFAST ” HAMILTON IN FULL MUAY THAI RULES vs CINTI ! Belfast sporting hero Gary Hamilton is set for a massive competitive gamble in October – first in Dublin in a Full-contact match on October 4 and then two weeks later the popular Hamilton crosses disciplines to Full Muay Thai for the toughest fight of his life in Italy. The ever-green WKN world featherweight champ will move from normal kickboxing to the dangerous Muay Thai division on October 19 in Italy. The 28 year-old Belfast World champion will face Italian favourite Filipo Cinti in the first ever kickboxing promotion to be broadcast live on Italian TV 1. Muay Thai differs from conventional kickboxing as it allows elbow strikes as well as use of the knee to the head. Hamilton’s coach Billy Murray of Belfast renowned ProKick Gym recognises the difficulty of the task ahead – but still favours his boy. “Gary is at the top of his game and he’s looking for new challenges,” he said. “He has been making his way in conventional professional boxing recently but when this opportunity came up to face Cinti in such a prestigious event, we couldn’t knock it back. Getting Gary in shape for the fight will not be a problem. He has always entered the ring in prime condition – Gary is in Spain right now taking in some warm weather training all in preparation of his up-n-coming hectic fights schedule. Belfast fight fans may remember Filipo Cinti from several years ago when he faced legendary French fighter Mohammad Samir at the Ulster Hall.